Sanuthi was diagnosed with a blood disorder last year. She needed a bone-marrow transplant to get better. Unfortunately, she has contracted a deadly fungal infection. Her parents put everything they had towards the transplant and have nothing left to save their daughter now. Sanuthi is her parents' only child and her parents Wawgsweera and Kumari were thrilled when she was born. But in just three months, they knew something was very wrong with their baby. Sanuthi had fever and was vomiting whatever she ate. In some time, she stopped feeding completely. Sanuthi's worried parents took her to a local hospital. It was here that their baby was diagnosed with a blood disorder, where her body simply did not produce healthy blood cells. The only way to survive for Sanuthi was to get new blood put into her body. Sanuthi's ordeal started then. At first she needed blood twice a month and by the time she turned six, she started needing blood every second day of the week. Blood transfusions are expensive and very dangerous if taken with such frequency. The extra iron in the outside blood tends to collect in organs, damaging them. Constant needles destroy the veins and it is getting more and more difficult to find a vein to give Sanuthi a blood transfusion. Unable to watch their cheerful, bubbly child suffer any longer, her parents decided that they would find a way to make their child better. Only a bone-marrow transplant could make Sanuthi better, but it is a risky procedure. Her parents decided to come to India to a reputed hospital so they could be sure that it would be a success. Sanuthi had a bone-marrow transplant early December last year. Sanuthi's parents had borrowed heavily from their friends and family. They sold off a lot of valuables and even solicited donations for the treatment. They thought that everything would go smoothly once they collected Rs 28 lakhs and got Sanuthi's bone-marrow transplant. But it was not to be. In her weakened state, Sanuthi contracted a fungal infection that will be deadly if not treated immediately. Her medicines are very expensive and are her only chance to get better. 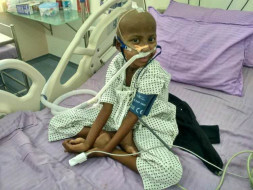 Unfortunately, her parents have nothing left and are struggling to even pay for medication that keeps Sanuthi alive. Sanuthi herself is a shadow of her former self. While she is always ready with a smile for her parents she has become very quiet. Too quiet for a 6-year-old. When she talks, she asks questions about school and her friends in school. They all seem like a distant memory to a child who has been through so much. Sanuthi's parents came to India with the hope of taking back a completely healthy Sanuthi. 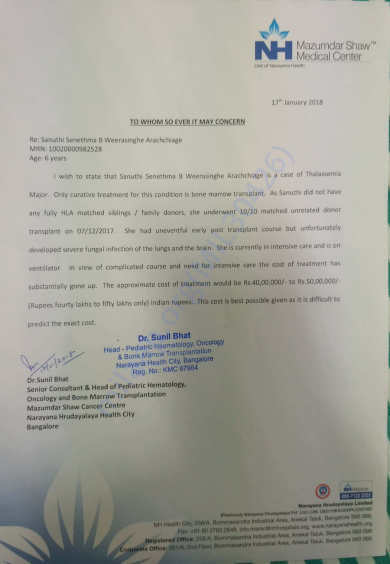 If Sanuthi does not get treatment, she will not make it. Her parents have nothing left and are stuck in a terrible position. They need help saving their only child. Your contribution will save Sanuthi's life.